TERRORISTS WIN: WHY THE SURPRISE? http://www.JewishWorldReview.com | The biggest surprise about the big win by the terrorist organization Hamas in last week's Palestinian legislative elections is that so many people were surprised. Worse than denial, is denying you have been in denial. Despite the Hamas and Palestinian Authority charters calling for Israel's destruction; despite unilateral concessions and actions by Israel; despite negotiated "land for peace" deals, which only Israel has kept; despite massive amounts of U.S. and European aid, much of which was funneled into Swiss bank accounts under the regime of the late Yasser Arafat; despite pressure and cajoling and confidence-building measures, none of it mattered. Hamas won anyway. Now comes more denial. One hears Westerners say things like "Hamas now must deliver because people are most concerned with jobs, running water and trash pickup so they will have to moderate their views." There is talk of cutting off U.S. and Western European aid to the Palestinians because of the Hamas victory. Do people sincerely believe that a religious mandate can be modified by economic threats, or that Hamas cannot get funding from others, like Iran? The "Quartet," comprised of the United Nations, European Union, Russian Federation and the United States, issued a statement that mentioned the "aspirations for peace and statehood" of the Palestinian people. Expressing the obvious, the statement continued, "�there is a fundamental contradiction between armed group and militia activities and the building of a democratic State." If the Quartet had not been in the state of denial, it would have seen the contradiction of attempting to make peace between Israel and people who are not interested in a "two-state solution," but in a region without Israel. Why should Hamas listen to the Quartet? The Quartet has repeatedly demanded that the Palestinian Authority disarm terrorist groups before negotiations proceed, but the terrorists have continued attacking Israeli civilians. Why shouldn't they when it appears the strategy is producing results for them? Following the election, President Bush told a news conference, "I don't see how you can be a partner in peace if you advocate the destruction of a country as part of your platform. And I know you can't be a partner in peace�if your party has got an armed wing." The president, indeed the world, should have seen this coming. For years  from mosques throughout the region, to newspapers and television programs  the violent rhetoric against Israel, Jews and the West has not only been tolerated, but also promoted by states we claim are our "friends." We now say we will have nothing to do with Hamas, but that will change. We will eventually deal with Hamas after they claim to have eliminated or modified their charter for Western consumption. How does one modify a charter that is the will of "G-d"? A senior Hamas official, Mushir al-Masri, told the Associated Press that recognizing Israel and negotiating with it are "not on our agenda." 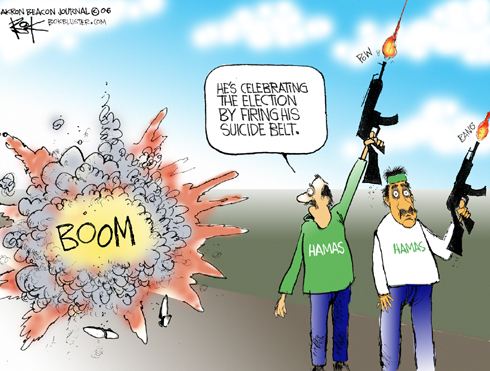 Even if Hamas did negotiate with Israel, why would anyone believe it would live up to any promises it might make? People who have tried to draw distinctions between the Palestinian Authority, Hamas, Islamic Jihad, Fatah and other groups have been in denial. They are all cut from the same terrorist cloth and all seek the same objectives despite occasional rhetoric to the contrary: a Palestine that doesn't include Israel. What else is one to make of a statement by Hamas leader Abdel Aziz Rantisi, in an interview with Al-Jazeera, as reported in the Jerusalem Post on June 10, 2003: "By Allah, we will not leave one Jew in Palestine. We will fight them with all the strength we have. This is our land, not the Jews � You will have no security except outside the homeland Palestine � We have Allah on our side�"
Last Sept. 16, Mushir al-Masri addressed a rally in Gaza. His remarks were carried on Al-Jazeera TV: "We have come here in multitudes to proclaim that Hirbiya and Ashkelon will be taken by the mujahideen � that weapons of the resistance that you see here will remain � so that we can liberate Palestine  all of Palestine  from the sea to the river, whether they like it or not." Google "Hamas Charter" and after reading it and the foregoing statements, the only ones who can believe they mean something other than what they say and do must be in extreme denial. And that condition can get a lot of innocent people killed.